Japanese Episode DP 186: "A Decisive Battle Between Rivals! Satoshi vs. Shinji!!" American Episode 1329: "Familiarity Breeds Strategy!" Satoshi is preparing for his upcoming match when he learns the Air Master taught his Glion how to use Giga Impact! The next day, the full battle between Satoshi and Shinji finally begins. Satoshi sends out Pikachu, and Shinji sends out Bossgodora. Pikachu's attacks don't seem to have any effect, so Satoshi replaces it with Goukazaru. The fire-type weakens Bossgodora with Flare Drive and then finishes it off with Mach Punch, giving Satoshi an early lead. Shinji's second pokemon is Toritodon. Satoshi sends out his Mukuhawk, so Shinji decides to copy Satoshi's counter shield strategy and have Toritodon use Muddy Water to deflect Mukuhawk's attacks. It then uses Body Slam to pin Mukuhawk to the ground and launches a Water Pulse into the air. As the attack gains momentum during its descent back to earth, Mukuhawk uses In-Fight on the ground below to escape. Toritodon then hits Mukuhawk with Ice Beam, so Satoshi recalls it and has Buoysel fight next. Toritodon uses Ice Beam again, so Satoshi has Buoysel use Aqua Jet to create an Ice Aqua Jet combination and deliver significant damage to Shinji's pokemon. Buoysel then follows up with Ice Punch, knocking out its opponent. Satoshi's third opponent is Drapion. The poison-type uses Pin Missile, so Buoysel makes a counter shield out of Water Gun to deflect the attacks. Buoysel tries to counter with Sonic Boom, but Drapion grips it with its tail! At last, Shinji's counterattack has begun! Will Satoshi be able to get out of this big pinch? To be continued! When the writers build up to something for years and years, it can be hard for them to wrap it up in a way that will satisfy everyone. Fan expectations are high, and any misstep, no matter how small, can ruin the entire thing for some people. Luckily, even the most jaded fan can find little to complain about with this three part battle. Overall, I thought this was a decent start to what's going to be the most important battle in the league. I liked seeing Satoshi take an early lead (See, Jun? It is possible to KO one of Shinji's pokemon!) and how that was all a part of Shinji's plan. And I know I've said this before, but I'm a huge fan of the techniques the TV show makes up that can't be replicated in the games. The counter shield stuff is always great to see, especially since it shows that Shinji isn't above copying someone who annoys him as much as Satoshi does if it'll mean victory. Meanwhile, Satoshi tricks Shinji into helping him create Ice Aqua Jet, a move that, if you remember, was invented by Hikari and also can't be done in the games. I do feel like it was kind of lame how Mukuhawk was able to take a friggin' Ice Beam, of all things, but it doesn't last too long the next time it's called out, so I guess it's alright. One thing I'm kind of "meh" on is the way this episode starts out. Before the opening theme, we see the trainers calling out their first pokemon of the match, Bossgodora and Pikachu. Then, after the theme, we cut away from the battle and see all the pre-game prep work. At that point, I'm wondering if they were doing that thing they used to do at the beginning of Diamond & Pearl where they'd get lazy and just use a part of the episode itself as the cold opening. But no, they weren't. Instead, we see the battle start right where the cold opening leaves off, leaving us with this really jarring transition from the night before the battle to the actual battle itself. As we closer and closer to the end of the season, I notice how we have yet to have an episode of Sinnoh League Victors retain all its Japanese music. We had a few in Season 12 that kept all (or nearly all) the music, so what's the deal? Did TPCI see those episodes as experiments, and then later decide that those experiments were failures? They were doing so well for a while, but it's like they've stopped trying all of a sudden. Another week, another batch of rewritten lines. Announcer: "Representing Kanto is Ash from Pallet Town, facing off against Paul from Veilstone City. The tension is formidable indeed!" I'm not really all that pleased with the wording of that first sentence. "Representing Kanto?" That makes it sound like Satoshi is the only person from the region competing which, while possible, isn't really anything you can gather from the Japanese version. The Japanese version states that Satoshi is "from" Kanto, not that he's the representative of the entire region. Ash: "Awesome, huh? Gliscor learned a lot from battling the Air Battle Master." In the Japanese version, Satoshi mentions Mitsuzoh by name. Barry: "I'll bet you already know which Pokémon you're gonna use, right?" Ash: "Barry, of course I do! I've given it a ton of thought, and I've got the whole thing figured out. Man, does this remind me of Lake Acuity. Paul and his Pokémon were so strong." Satoshi isn't nearly as confident as Ash seems to be. Originally, he tells Jun that he's nervous about his upcoming battle and that this nervousness reminds him of how he felt at Lake Eichi. Dawn: "You look absolutely handsome in that outfit, Piplup." Now that Kenny is out of the picture, Dawn's attention turns toward the little penguin thing that's always following her around. LilBlueshippers (a term I was able to discover after only about 30 seconds on Google) around the world rejoiced. Hikari calls Potchama kakkoi, or "cool." It's the exact same thing she said about Kengo in her letter to him a few episodes ago. TPCI translated that as "handsome" back then, too, so if nothing else the company is consistent. And now, filling out its quota for "complete rewrite:"
Paul: "I just don't like him." Paul: "He talks just like my brother. Friends...trust...my brother says those things all the time too." Paul doesn't like him. Present tense. Shinji didn't like him. Past tense. So while Shinji has at least gained some amount of respect for Satoshi over the course of his travels through the Shin'ou region, Paul's feelings toward Ash don't seem to have changed at all. Which kind of ruins any character development the character's been going through these past four years or so. Brock: "Metal Sound is a move that's used to lower your opponent's Special Defense. And if it's reaching all the way up here, it must be really powerful." You may feel like I've been hard on TPCI lately, but there are times when I can give them props for doing something right. This is one of those times. In the Japanese version, Takeshi states that Metal Sound lowers the opponent's Defense. Which is incorrect; it actually lowers the opponent's Special Defense. The dub seems to have caught this error and decided to fix it. Dub viewers don't get the eyecatches. Which is a shame, because 1) they're awesome, and 2) they sometimes contain extra lines of dialogue. During the eyecatch that plays during the return from commercial break, we hear Satoshi say Goukazaru! Kimi ni Kimeta!, or "Goukazaru! I choose you!" But, since the eyecatch is removed from the English version, the line that's said during the eyecatch is removed as well. James: "That Gastrodon's no slouch!" Jessie: "There is life after Infernape!" Whenever I do episode comparisons, I always re-watch the Japanese version right before watching the dub. And, sometimes, I listen to the dialogue TPCI gives the Rocket trio and wonder if I would have been able to understand what the hell they're getting at if I didn't know what they were supposed to be saying in the first place. I'm the same way when I watch movies based on books I've read; would the movie have made as much sense if I didn't have the knowledge of what happens in the book to fill in the gaps? This little exchange is a perfect example of what I'm talking about. In the Japanese version, Musashi says that she guesses they'll have to pay attention to the entire battle, not just the parts with Goukazaru in it. And...well, I know that, technically, the same message is being conveyed in the dub. But it's done in such a strange and backwards way that I wonder if that message comes across to people who haven't seen the Japanese version. Did you guys get what TPCI was going for the first time you heard that line? 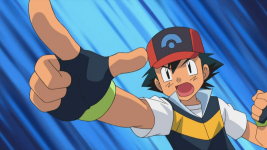 Ash: "I've got it! Alright, Staraptor, use Close Combat by banging hard on the ground!" Paul: "Wait a minute! That move..."
Shinji isn't caught off guard as much as Paul seems to be. Originally, he calmly states that this is what Satoshi was able to come up with. Paul: "Number four is Buizel. Wow. You're pathetic and predictable." Is TPCI in denial about Paul's character development or something? Are they using some outdated bio of him written at the start of the series and applying that to all the dialogue he says now? In the Japanese version, Shinji sighs and tells Satoshi that he's unbelievable for choosing the team that he did. Ash: "Buizel, get outta there! Quick!" The Japanese version gave Satoshi's voice an echo effect for this line, presumably for dramatic effect. The dub does not.